The new Wilson Rush Pro offers the ultimate performance shoe with a low-to-the-ground feel. With it's low- profile and plush cushioning, it's comfortable right out of the box. It features a unique dynamic fit from heel to toe which is designed to improved the court feel of the shoe as well as optimize a player's agility. Try the new Rush Pro for a well- cushioned, low-profile speed offering from Wilson. Fit: Length fits true to size. Width is medium. 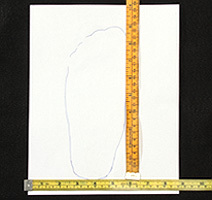 Arch support is medium. No break-in required. Upper: Synthetic leather and mesh in the upper for lightweight performance. It features a fully-constructed inner sleeve for an intuitive fit and increased stability, re- enforced by R-dst technology for extra cushioning and rebound. Inlay: Ortholite Comfort Foam insole for increased cushion and support. Midsole: 3-D Injected TPU Forefoot Piece for excellent comfort and responsiveness. It's designed with Wilson's DF1 Dynamic Fit with a 6mm drop from heel to toe for low-to-the-ground court feel and maximized agility. Outsole: New Duralast outsole for excellent durability and traction. 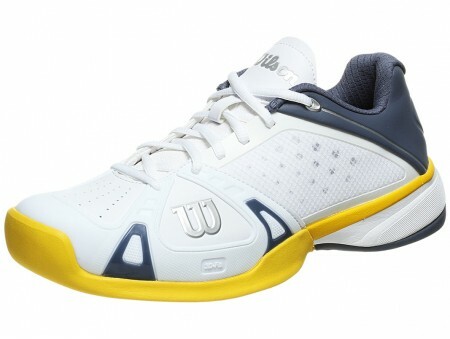 The Wilson Rush Pro White / Flint Grey / Union Gold Men's Tennis Shoe is now available online at our iTennis Tennis Store. Fantastic all round experience. Right from the search of the right racket suiting my serve and volley game, payment experience, delivery of the racket, racket quality and off course the PRICE, everything was just perfect! Keep up d great work itennis!